There is no question that miniature and small hostas are extremely popular among hosta enthusiasts. 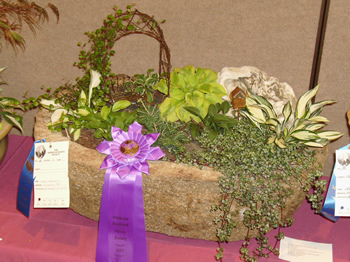 Many collectors have an area devoted to small and mini hostas, and some people only collect little hostas. The Book of Little Hostas: 200 Small, Very Small, and Mini Varieties is the first book written exclusively about a specific group of hosta cultivars. 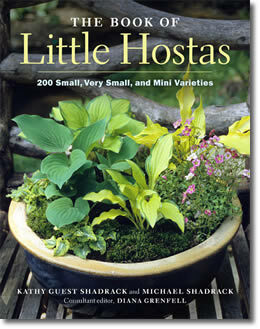 Authors Kathy Guest Shadrack and Michael Shadrack give a little insight into their book and the enchanting world of little hostas. Why little hostas? Giant hostas are quite popular, too, as are hostas with red petioles, and hostas with ruffled leaf edges, and... and... Why did you choose to write a book exclusively about little hostas? Mike: Because little hostas have all the shapes, colors and attributes of the larger hostas, but you are able to landscape, collect and enjoy them in a much smaller space. Kathy: Gardens are getting smaller and the time and money available to maintain them is getting less, too. We are already seeing the downsizing of other garden plants, not just hostas. What is it about little hostas that makes them so irresistible and popular? Kathy: I love them because they lend themselves to all sorts of containers, troughs, deck boxes, patio trays, ceramic pots, even window boxes and found objects. Mike: I like the fact that it is relatively simple to make a small raised bed for the little ones or create a small woodland walk. A whole collection can be kept on a balcony, patio or deck. Some people have a lot of trouble growing little hostas. What is the biggest mistake gardeners make when growing little hostas? Mike: Little hostas would be lost planted with bigger plants. They really need their own space and a careful watering regime. Kathy: They need more light and better drainage than their larger cousins. I also like to keep their surroundings to scale. Are there hybridizers out there who are working primarily to develop little hostas? What do you think the future holds for new little hostas? Mike: Many hybridizers have noted the exciting trend towards little hostas and are developing their own lines. Bob Solberg and Mark Zilis have been producing little hostas for some time. Alex Malloy and Randy Goodwin are producing some exciting new plants and Naylor Creek is bringing over some of the best from Europe, especially from Dutchman Marco Fransen. A lot of the newer mini, very small and small hostas are emerging as tissue culture sports, and we can look forward to dozens more. Kathy: In the book I encourage people to collect hostas by "Dynasties," and these connecting lines of sports and sports of sports are growing longer all the time. I hate being asked to pick a single favorite hosta, but what is the one little hosta you could never be without? Kathy: I like H. 'Academy Verdant Verge'. Mike: There are so many good ones that it is difficult to choose! I just love H. 'Tickle Me Pink' and we both would not be without H. 'Dragon Tails'. My thanks to Kathy and Mike for taking time to give us an inside look at this fun group of plants! The Book of Little Hostas: 200 Small, Very Small, and Mini Varieties will be released in mid November 2010 and you can order your copy here.